The heart of today’s Gospel concerns Jesus’ casting out a demon. I’ll be honest: I was tempted to tiptoe around the exorcism. Exorcism is tricky to preach on, especially for Episcopalians. We don’t generally go in for that exorcism business, especially not at a place like St. John’s Lafayette Square. Exorcism, we all know it is part of the tradition, we all know that it was a part of Jesus’ own ministry. But in the Episcopal Church, we sort of treat Jesus’ exorcism ministry as if it were part of his “college years.” As in, “well I tried it back in college, but that was college.” We sort of like to pretend it didn’t happen. holding a map and chatting as they made their way into Georgetown. I couldn’t make out any of what they were saying, I think they were speaking Korean, but I definitely heard “The Exorcist” which was followed by more Korean and some nodding. 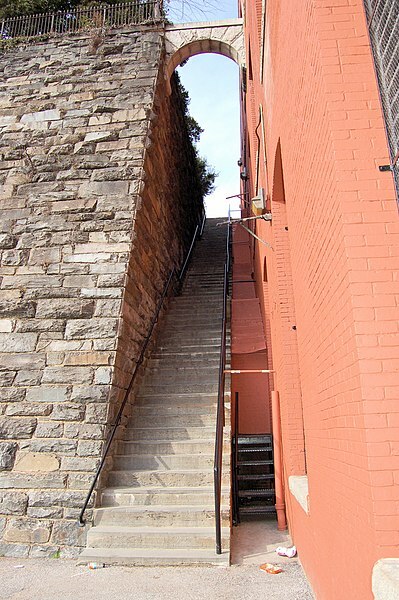 They were on their way to the iconic stairs that the priest character is thrown down at the end of the movie. Suddenly I thought, if I am going to be a priest who lives in Georgetown, I am have to figure out what I think of exorcism. I haven’t yet had any nightmares about getting thrown down stairs. So my geographical existential crisis aside, what is all of this about exorcism? As very over-educated Episcopalians, as Christians who believe firmly in reason and scientific inquiry, what are we to do with demons? For the past several hundred years, we have tried to rationalize the demons away. We like to read this story like any of the other healing stories of Jesus. The modern interpretation of demon possession would have this man suffering simultaneously with multiple personality disorder, Tourette’s Syndrome, and epilepsy. We have diagnosis for this guy, and today we would have several medications. For some reason, we are comfortable with Jesus the healer. Jesus whose healing powers are constrained to what can now be accomplished with the help of a good pharmacist. So we want to dismiss the demons as a first century way of describing what we know now to be neurological disorder. But the demons don’t stay away. The demons don’t stay away. They are all over our society today, all over. Our world is full of demons. (LONG PAUSE). Have you seen the Vampire Diaries, True Blood, or The Twilight Series? Vampires are everywhere. The Walking Dead, an HBO show about Zombies is breaking all-time cable viewing records. The demons are legion these days. We, as a post-enlightenment society don’t believe in evil spirits, but we want to watch them on TV. Sociologists are studying this absolute rage in magical fiction, the rise of the walking dead on our televisions. They believe we have arrived at a turning point in our cultural understanding of truth. As we move from Modernism to Postmodernism, serious cultural philosophers are talking about the sensed need for what they call “re-enchantment.” All of these Zombies, Vampires, and witches and wizards (think Harry Potter), all of the desire and money our society seems to be willing to pay out for magical fiction. The experts think we are longing for something magical missing in our radically scientific and rational explanations of reality. If in the Modern era, science won the day and the world of the spirit was dismissed as superstition, in the Post-modern era people are hungry for something Science can’t provide. So I think we need to look again at this story of exorcism, we need to not gloss over this somewhat uncomfortable narrative. Christians are spiritual people. We believe there are parts of reality our science can never fully grasp. Episcopalians are usually very careful about what we ascribe to those areas, and I am with you. I know Luis will be glad to hear I am not planning to open a ministry center for exorcism as part of the upcoming work of our pastoral care committee. I am skeptical about a great deal of what Christians have said and done, over our history, about demons. I’ll tell you why. For a lot of our history Christians who were in the business of exorcising demons were quick to point out the demons in others. If we start thinking demons are real, we can become convinced pretty quickly we know who has one. I am sure several members of our youth ministry would offer their brother or sister up for exorcism. We might do the same with our bosses or that one particular neighbor. But looking for demons in others tends to lead to abuse. The Church’s least Christian moments have been witch-hunts. I think the Church has had enough of that kind of demon-hunting. The harder work, the harder work, is to look at ourselves, to examine our own inner spiritual territory. The moments where I have thought “there is something to this idea of ‘possession,’” have been when I am least proud of my behavior. I’ll think about something I have said in a long argument with my sister or brother and think, “that didn’t even sound like me.” Have you ever had a moment like that, when you were so overcome by an irrational anger or fear that you hear what you are saying and think “Am I even saying these words? Who is this?” There are moments in our lives when we are overcome, where we do not behave as ourselves. There is something supernatural to evil. I think we could talk about demons, about evil forces at play in our world today. I think we even have names for some of those demons: greed, sexism, homophobia, classism, and ethno-centrism to name a few. I think racism is one of the most powerful demonic forces out there, a force that seems to grab hold of human beings and cause them to act in inhuman ways. You know that line from “The Usual Suspects:” “The greatest trick the devil ever pulled was convincing the world he didn’t exist?” That is about how I feel when I hear the words “I’m not a racist.” Just last month I was up in New York City with my dad. One strangely warm December night after dinner we were on a corner, waiting for a cab. After a long wait, we hailed one, but we had been waiting behind another guy, and so we tried to give him the cab. As he reached for the door, the cabby sped off. The young man we had tried to pass the cab to was black. I stood on that corner, waiting for another taxi, and just stewing in righteous anger, but then I thought about earlier that week when I was stopped at a traffic light in Columbia Heights. On the sidewalk next to me was a group of African American teenagers, and I hit my door-lock button. It aint just New York cabbies. I think that racism, that old demon, grabs ahold of all human beings sometimes. These days it happens subtly, quietly. We have come a long way, but to fool ourselves into thinking that racism is over, or that homophobia is a thing of the past, that misogyny is a remnant of less enlightened times is to allow these demons to run unchecked in our society, and, more importantly, in ourselves. Do I think that there is some sort of supernatural power to these evils? Perhaps. I can’t find any other satisfactory explanation for why human beings would treat one another as less than human. So yeah, I think there is something really supernatural, something demonic, some evil power out there in the world. More than that, so much more than that, am I convinced that there is a supernatural power out there for good. I believe it is a real possibility for human beings to come under the influence of evil. But I have also seen real evidence of people who were possessed by what Abraham Lincoln called “The better angels of our nature.” I am convinced that God is out there in the world working. I am convinced that the supernatural power of God is love, and I have seen that love at work in the world. When I look at the work that people like Sharron Dinney are doing at the Kwasa center, our partners in South Africa. When I see people like Sharron who dedicate their lives to overcoming the boundaries of race and class, to helping children who otherwise would go hungry be fed and educated, I am convinced. For any of you who haven’t met The Very Rev. Sharron Dinney, you will have the chance this Spring when our friends from Kwasa come visit us at St. John’s. In the short time I met her, I can only describe Sharon as overflowing. There is something about her that just overflows with God’s love. God’s work in our world is not confined Sharron. I see it all the time here at St. John’s. One of our new parents recently said, “I am just amazed how much I love my child.” Just amazed. We can be possessed by love, amazed by the supernatural power of love coursing through us. I see God’s work of love possessing a number of folks we have here caring for elderly parents or giving up vacation time to continue to re-build New Orleans or even simply taking flowers to a homebound parishioner. Call me un-rational, but I am convinced that God is at work all over our church, all over our city, all over our world. Our job is one of listening, and discerning the voices. The more time we spend in prayer alone and together, in reading scripture, in breaking bread with one another in Jesus’ name, the more capacity we have for figuring out which voice belongs to God and which are the other voices clamoring for our attention. The more we are exposed to God’s love, to God’s vision for a community shaped by love, the more we are aware of the forces which oppose God’s kingdom from breaking through in our own lives. life is stronger than death.I think we need to take the demons seriously, and not just because I don’t want to end up at the bottom of the stairs on 36th Street in Georgetown. I think we need to be on guard against all the evil powers of this world, all those forces that would deny the goodness of God’s creation, but I think our best defense is a good offense. We need to let God re-enchant our world. We need to be open to seeing God’s love breaking through in our everyday lives. Sometimes we have to abandon all our rationality and just let God love us and love others through us. Wisemen and Mad Men (an Epiphany sermon). This is one of the best discussions of good, evil, demons ahd us that I’ve ever encountered. I’m sending it on to quite a numberof people and keeping a copy to remind me. Thank you very much.